Home | Person Search | Our People | George E. Nowack, Jr.
George E. Nowack, Jr., founding partner of the Community Association Practice at Weissman, P.C., has represented condominiums, cooperatives and homeowner associations since 1981. In addition to his extensive community association work, he is a nationally recognized expert on community association insurance issues, especially Directors & Officer’s claims. He has assisted three national insurance companies in drafting D&O policies and the firm is approved counsel for six insurance companies that specialize in writing for D&O policies. An active member of the Community Associations Institute (“CAI”) since 1982, he has been a featured presenter on numerous issues at many of the CAI National Conferences since 1984. He has also been a favorite speaker at local chapters of CAI from Massachusetts to Hawaii. George served two terms on the Board of Trustees and was President-elect 1993-1994 and President 1994-1995. George was awarded the 2007-2008 Award of Excellence in Designations. He received the Educator of the Year award from Community Associations Institute of Georgia in 2003. CAI presented him with its National Presidents award in 2004 and 2005 for his extraordinary services to the Presidents of the CAI Board of Trustees. George’s exceptional dedication to CAI was recognized in May 2011, when CAI awarded him its Distinguished Service Award. In 1994, his peers named George to the charter class of the College of Community Association Lawyers. 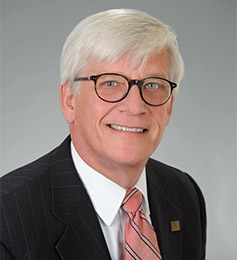 George was elected to the College’s Board of Governors in 2002. He served a two-year term as the Dean of the College from 2007-2009. George is a member of the faculty of the College’s annual three day Community Association Law Seminar and since 2000 has been the speaker at the two general opening sessions where he presents a review of the 50 most significant cases affecting community associations and discusses the trends created by these cases. One of only four recipients, the College presented him with the 2010 Gurdon Buck Award, the College’s most prestigious recognition. George has written weekly columns on community association issues for the Atlanta Journal and the Gainesville Times, as well as publishing articles in Common Ground, Real Property & Probate, the Atlanta Business Chronicle, The Newsletter of the Independent Insurance Agents of Georgia, and other publications. He has also been quoted in the New York Times and the Wall Street Journal, and been the featured guest on local and nationally syndicated radio shows. George was a member of the initial board of directors of St. Anne’s Terrace, a 100-unit apartment retirement community. In his 17 years on the board of directors, he filled the role of both the Vice-President and President at different times during his tenure. Are You Ready for the New Insurance Required for Condominiums?